Earlier this month, a man lent his BMW to a pair of strangers he met at a Hooters on the promise they'd return it in a day. Eleven days later, it was found untouched with all of his valuables inside. Not many people are inclined to let random strangers borrow their cars. It&apos;s a terrible idea. 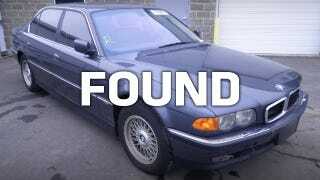 The car, a 2000 740iL, was reported stolen on July 13th, six days after the 46-year-old owner let a couple he'd only just met at the Fairfax City Hooters borrow it believing they were going to a wedding. Inside were his laptop and an engagement ring, both of which were still in the car when a Fairfax County police officer found the car less than seven miles down the road in a shopping center parking lot. The BMW was completely undamaged, unlocked, and the keys sat on the driver's seat. Fairfax City police Sgt. Joe Johnson told the Washington Post that the owner was both genuine, and someone who could stand to learn a lesson about sharing. Hopefully he won't be so generous with his vehicle in the future. But it wasn't a false police report, and it wasn't an insurance scam, so he's good to go. It is unlikely any charges will be pressed or that Fairfax City police will pursue a stolen auto investigation.